Speaking of The Third Man… There’s that one most famous scene where Joseph Cotten and Orson Welles go up in the Wiener Riesenrad and Welles, as Harry Lime, talks about how insignificant humans are. “Look down there. Tell me. Would you really feel any pity if one of those dots stopped moving forever? If I offered you twenty thousand pounds for every dot that stopped, would you really, old man, tell me to keep my money, or would you calculate how many dots you could afford to spare?” The film takes place in Vienna, after World War II. Few people have any money and so the amusement part is abandoned. There’s something very special about that. And when Lime not so subtly tells Joseph Cotten, as Holly Martins, that he might just throw him out of the car, it’s believable. Most people find abandoned places creepy. That’s especially true if the location is one where people usually are—in abundance. Like an amusement park. When it’s empty, it seems almost post-apocalyptic. But I like it. To me, it is the way things ought to be. It reminds me of 10,000 year old settlements like Catalhoyuk. The things we humans make outlast us by a long time. In a sense, it shows that we are better craftsmen than God. But even still, what we do and who we are only matters right now. Shakespeare wrote only 400 years ago, yet the language has changed so much that we probably wouldn’t even understand the words if we heard them spoken the way they were while the poet was alive at the Curtain theater. And Shakespeare is lucky. Many thousands of people over the years have worked very hard to keep his work alive. And for what? The plays of Shakespeare like the work of all humans is destined to disappear, just as humans themselves. And I see nothing sad about that. In fact, it is a testament to the greatness of humans that we take pleasure in the creation of the ephemeral. Many of us even create art without any intention of sharing it with anyone—just for the joy of doing it. The article explains, “The Great Wall is 13,170 miles long and vast sections receive little maintenance because of the enormous cost of caring for such a monumental structure.” I’ve never especially wanted to see the Great Wall. But if I could go here, where this picture was taken, well, that’s another matter entirely. That’s a beautiful thing: the forest is literally eating the wall. Imagine if you had built the wall and lived for thousands of years. Would you do something to stop the destruction of your wall? If you did, you would be a fool. You would be so much better to make something else that is ephemeral like yourself. Everything is ephemeral. Even the universe is ephemeral. God, being a creation of man, is ephemeral. 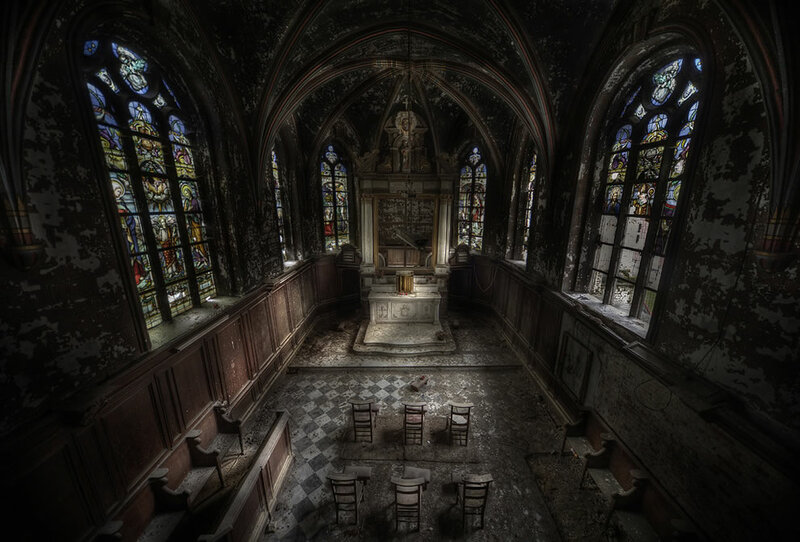 Just look at this abandoned church with its beautiful stained glass windows. As with so much in life, they overshadow man. Or am I wrong? When you looked at the picture, did your eyes avoid all the beautiful art that this church still is? Did your eyes instead, lock onto the child’s coffin in the middle of the picture? I wonder if it’s empty. And if it isn’t, does it matter? I am not afraid, because I know the answer to that question. This entry was posted in Social, Spiritual/Religious, Visual Arts by Frank Moraes. Bookmark the permalink. Beautiful writing on your part. And beautiful photos in the link! Really?! Thanks! I’ll have to read it. Your first image was taken by myself and has been used on numerous sites without my permissions. Please modify it so that it hyperlinks to the address given in the ‘website’ section of this form and appropriately attributes the copyright, or remove it. Thanks. @Pixog – Thanks for the heads up on that. I hadn’t even noticed that attributions in the original article given they were done in a light grey. I hope what I’ve done here is acceptable.